As a Victorian classic of 19th century Boston, the Samuel Sewall Inn offers New England antiquity with every modern convenience. Our 21 guest rooms, luxurious social spaces and ever-attentive staff will make your stay in both Boston and Brookline feel like a home away from home. 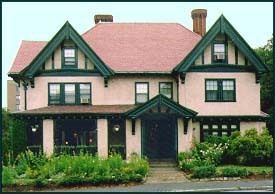 The Samuel Sewall Inn is located just two blocks from Boston’s MBTA Green Line. This public transportation system offers quick and convenient travel to such Boston destinations as Fenway Park, the Freedom Trail and the North End as well as campus stops for Boston College, Emerson College and Boston University. We are a part of Coolidge Corner, a Brookline neighborhood that offers fine dining, an independent bookstore and the historic Coolidge Corner theater. The Samuel Sewall Inn, known for its warm, comfortable ambiance and spacious guest rooms, offers guests a relaxing respite outside of Boston’s city center. Polished, friendly service combined with luxurious amenities ensures guests an optimal stay. Each morning at the Samuel Sewall begins with a gourmet breakfast prepared by our personal chef. This daily offering includes a hot entree, homemade pastries, farm-fresh eggs and a selection of locally roasted coffee. Treats are presented throughout the day, including an array of fruit, chocolate covered almonds and freshly baked cookies. The Samuel Sewall Inn is located in close proximity to Boston’s Longwood Medical Campus which includes the Boston Children’s Hospital, the Dana Farber Cancer Institute and the Brigham and Woman’s Hospital. Patients and their families are encouraged to inquire about our preferred rates for guests undergoing treatment at these locations. "Thank you for making this an absolutely amazing visit! The room and the Inn were extremely cozy and beautiful. We appreciated the small touches, such as the turndown service, snacks (available all day!) and of course, the flawless service. The staff has been very accommodating and friendly. It's been a pleasure!" "We have stayed in many places in the world but this is by far the best. The team that works here never say no, but just ask how they can help even more. Not to mention the atmosphere and breakfast!" "This place is outstanding. It feels like home away from home. The staff is extremely professional and friendly. The breakfast was terrific and the rooms were spotless. I love this place!"